Happy Meat-Free Monday! Sometimes, even the Opinioness doesn’t feel like cooking (say it ain’t so!). But I’m still hungry and want to devour something fab. 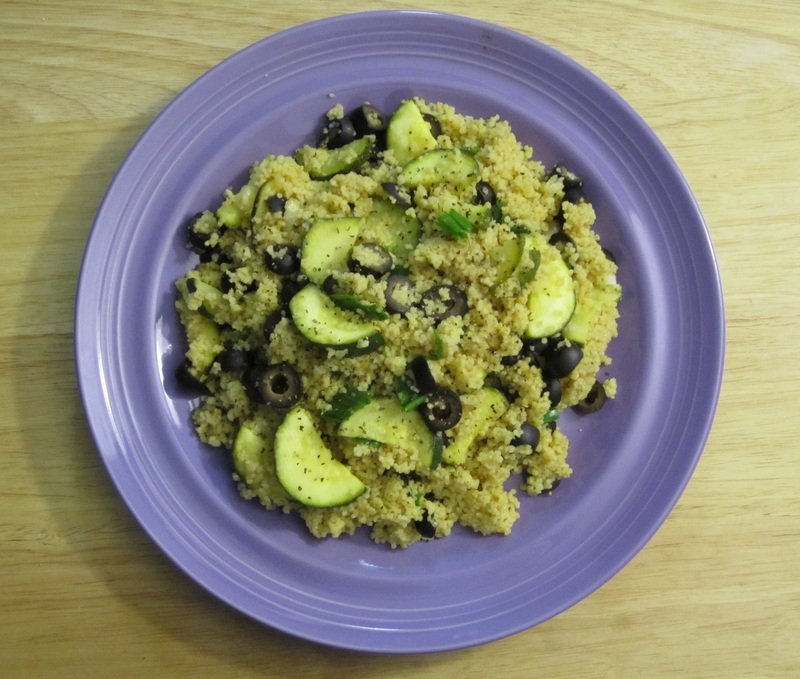 So this Mediterranean Zucchini Lemon Couscous fits the bill nicely. This recipe hails from Donna Klein‘s The Mediterranean Vegan Cookbook, given to me as a present by my bestie Gianni, blogger at The Latest Issue. It’s insanely quick (15 minutes from start to finish) and delish. It’s also a perfect transition meal or side dish for end of summer, beginning of fall; light enough for warm weather but warm and satisfying for brisk nights. Couscous is a versatile grain used frequently in North African and Middle Eastern cuisine. Zucchini, one of my fave fruits, possesses a delicate taste and is still in season. The acidity of the lemon juice enhances the tastes of both ingredients while the saltiness of the black olives and the zest of the scallions brings everything together. In a medium saucepan, heat olive oil. Add white parts of scallions and cook for 2 minutes, stirring, until softened and golden. Add zucchini and cook for another 2 minutes. Add veggie broth, lemon juice, lemon peel, salt and pepper. Bring to a boil over high heat. Stir in the couscous. Remove from heat, cover and let sit for approximately 7 minutes until all liquid is absorbed. Uncover and fluff with a fork. Add green tops of scallions and black olives and stir. Add more salt and pepper if needed.